CRAZED - Cards with this skill gain (x) amount of attack after dealing damage to an enemy card or hero. Effect is permanent. Can be blocked from activation by Sturdy and Shield. Card must lower an enemy card or hero by at least one health point to activate. Can be stolen by Hijack. FC1 (10 attack, 1 Crazed) attacks and destroys EC1. FC1 gains 1 attack (now 11 attack). Next turn, FC1 attacks hero directly (no opposing card). FC1 gains 1 attack (now 12 attack). FC1 (9 attack, 3 Crazed) attacks EC1 (10 Sturdy or Shield). No damage done, no attack increase. EC1 (14 attack, 18 health, 5 Hijack). FC1 (12 attack, 7 Crazed) attacks EC1. FC1 gains 7 attack from Crazed, but then gets Hijacked by EC1. FC1 gains 2 attack (now 14 attack), EC1 gains 5 attack (now 19 attack for one turn, 6 health). RECOVER - Cards with this skill increase both max and current health by (x) amount whenever two cards are combined by the card owner. Effect is permanent. Effect does not heal and cannot get a player back to perfect health. FC1 (12/15 health, 4 Recover). Player combines new card with FC2. FC1 gains 4 max and current health (now 16/19 health). BOMB - Deals (x) amount of damage to enemy card(s) adjacent to the card that is attacked by a card with this skill. Cannot be blocked by Sturdy. Can be blocked by Shield and Bodyguard. FC2 (3 Bomb) attacks EC2. EC1 (2 health) and EC3 (3 health, 5 Sturdy) both get destroyed by Bomb damage. FC5 (4 Bomb) attacks enemy character directly (no opposing card), no Bomb damage is dealt. FC2 (5 Bomb) attacks EC2. EC1 (3 Shield, 15 health) takes 2 Bomb damage (no Shield remaining, now 13 health). EC3 (4 Bodyguard from EC4, 11 health) takes 1 Bomb damage (still 4 Bodyguard, now 10 health). CRIPPLE - Reduces the attack of a random enemy card by (x) amount for one turn. Skill can stack and render affected enemy cards unable to attack so that Bomb, Crazed, Gas, and Leech do not activate. Cannot reduce attack given by Motivate. FC1 (2 Cripple) targets EC3 (10 attack, 3 Gas). EC3 deals FC3 8 damage, FC3 is now Gassed. FC1 (4 Cripple) targets EC2 (6 attack, 3 Gas). FC2 (2 Cripple) also targets EC2. EC2 (now 0 attack for one turn) won't be able to Gas FC2. FC1 (5 attack). FC2 (3 Motivate) is played, FC1 gains 3 attack. EC1 (7 Cripple) targets FC1. FC1 still has 3 attack provided by FC2's Motivate. CRIPPLE ALL - Reduces the attack of all enemy cards by (x) amount for one turn. Skill can stack and render affected enemy cards unable to attack so that Bomb, Crazed, Gas, and Leech do not activate. Cannot reduce attack given by Motivate. Hero (1 Cripple All) targets EC1 (8 attack), EC2 (5 attack), and EC3 (3 attack). FC1 takes 7 damage, FC2 takes 4 damage, FC3 takes 2 damage. Hero (1 Cripple All), FC1 (3 Cripple All), and FC2 (4 Cripple All) all target the same EC1, EC2, and EC3 in example #1. All enemy cards are Crippled to 0 and cannot attack for one turn. PUNCH - Hits a random enemy card, causing (x) amount of damage. Cannot be blocked by Sturdy. Can be blocked by Shield and Bodyguard. FC1 (4 Punch) targets EC3 (5 Sturdy). EC3 gets dealt 4 Punch damage. FC1 (4 Punch) targets EC5 (5 Shield). EC5 takes no damage (still has 1 Shield). FC1 (4 Punch) targets EC2 (5 Bodyguard). EC2 takes no damage (still has 5 Bodyguard). PAYBACK - Deals (x) amount of damage to any card that attacks a card with this skill. Cannot be blocked by Sturdy or Bodyguard. Can be blocked by Shield. If the card with this skill is destroyed, Payback will not activate upon destruction. EC1 (14 health) attacks FC1 (4 Payback). EC1 immediately gets dealt 4 Payback damage. EC1 attacks and destroys FC1 (4 Payback). EC1 takes no damage. HERO PAYBACK - Destroying a card and hitting the hero with the remaining attack will not activate the Payback. Also, the card that reduces the hero's health to zero, direct hit or not, will not activate the Payback. FC4 attacks enemy hero (2 Payback) directly (no opposing card). FC1 immediately gets dealt 2 Payback damage. FC1 attacks and destroys EC1, then attacks enemy hero (2 Payback) with the remaining attack. FC1 takes no damage. FC5 attacks enemy hero (2 Payback) directly (no opposing card), bringing enemy hero's health to 0. FC1 takes no damage. BOOST - Cards with this skill gain (x) amount of additional attack whenever two cards are combined by the card owner. Effect is permanent. Can be stolen by Hijack. FC1 (12 attack, 3 Boost). Player combines new card with FC2. FC1 gains 3 attack, now has 15 attack. FC1 (12 attack, 3 Boost). EC1 (15 attack, 5 Hijack). Player combines new card with FC2. FC1 gains 3 attack, but then gets Hijacked by by EC1. FC1 (still 12 attack), EC1 gains 3 attack (now 18 attack for a single turn). CHEER - Increases the attack of a random friendly card by (x) amount for one turn. Only works on cards to the right of the card with this skill, because the cards to its left have already attacked. Can be stolen by Hijack. FC1 (2 Cheer) increases the attack of FC3 (10 attack) to 12 attack. Next turn, FC3 reverts to 10 attack, FC1 increases the attack of FC4 (14 attack) to 16 attack. Player has only 2 cards out. FC2 (5 Cheer) will not increase the attack of FC1, skill is not activated. EC2 (13 attack, 4 Hijack). FC1 (6 Cheer), FC2 (12 attack) increases FC2's attack. EC2 Hijacks 4 attack from Cheer. FC1 gains 2 attack (now 14 attack for one turn) and EC2 gains 4 attack (now 17 attack for one turn). CHEER ALL - Increases the attack of all friendly cards by (x) amount for one turn. Only works on cards to the right of the card with this skill, because the cards to its left have already attacked. Can be stolen by Hijack. FC1 (3 Cheer All) increases the attack of FC2, FC3, and FC4 by 3. Next turn, FC1 increases the attack of FC2, FC3, FC4, and FC5 by 3. FC3 (3 Cheer All) increases the attack of FC4 by 3. Next turn, FC3 increases the attack of FC4 and FC5 by 3. EC1 (8 attack, 3 Hijack), EC2 (13 attack), and EC3 (14 attack, 1 Hijack). Friendly hero (2 Cheer All) increases the attack of FC1 (12 attack), FC2 (16 attack), and FC3 (10 attack). EC1 Hijacks FC1's attack increase. FC1 (still 12 attack), EC1 (now 10 attack for one turn). EC3 Hijacks 1 attack increase from FC3. FC3 (now 11 attack for one turn), EC3 (now 15 attack for one turn). SHIELD - Prevents (x) amount of damage dealt to a random friendly card for one turn. Effect is not permanent. Will prevent damage from Punch, Bomb, and Payback. Can prevent a card from be Gassed, but does *not prevent damage after being successfully Gassed. Hero (2 Shield) protects FC1 (15 health). FC1 attacks EC1 (1 Payback). FC1 takes no damage (15 health, 1 Shield remaining). EC1 (8 damage) attacks FC1. FC1 takes 7 damage (8 health, no Shield remaining). FC3 (5 Shield) protects FC2 (20 health). EC1 (2 Punch) targets FC2. FC2 takes no damage (20 health, 3 Shield remaining). EC2 (14 attack) attacks FC2. FC2 takes 11 damage (9 health, no Shield remaining). SHIELD ALL - Prevents (x) amount of damage dealt to all friendly cards for one turn. Effect is not permanent. Will prevent damage from Punch, Bomb, and Payback. Can prevent a card from being Gassed but does not prevent damage after a card is successfully Gassed. Hero (4 Shield All) protects FC1 (3 health), FC2 (12 health), and FC3 (6 health). FC2 attacks EC2 (7 attack, 3 Payback, 1 Bomb). FC2 takes no damage (12 health, 1 Shield remaining). FC3 attacks enemy hero (2 Payback) directly. FC3 takes no damage (6 health, 2 Shield remaining). EC1 (5 attack, 4 Punch) targets FC2 with Punch. FC2 takes 3 damage (9 health, no Shield remaining). EC1 and EC2 attack. FC1 takes 1 attack damage and 1 Bomb damage (1 health remaining). FC2 takes 7 attack damage (2 health remaining). FC3 takes no damage (6 health, 1 Shield remaining). LEECH - Heals the card with this skill by (x) amount after dealing damage to an enemy card. Effect is permanent. Skill will not activate when attacking the hero directly. Can be blocked from activation by Sturdy and Shield. Card must lower an enemy card by at least one health point to activate. Skill only restores to max health. FC1 (4/10 health, 7 Leech) attacks and destroys EC1 (2 health). FC1 heals to 10/10 health. FC4 (6/15 health, 10 Leech) attacks enemy hero directly (no opposing card). FC4 does not heal. FC1 (10 attack, 4/10 health, 7 Leech) attacks EC1 (12 Sturdy or Shield). FC1 does no damage, does not heal. JAB - Cards with this skill reduce the effects that prevent attack damage to an enemy card by (x) amount. Skill works on Sturdy and Shield. FC1 (5 attack, 3 Jab) attacks EC1 (5 Sturdy or Shield). EC1 takes 3 damage. FC1 (5 attack, 3 Jab) attacks EC1 (8 Sturdy or Shield). EC1 takes no damage. STURDY - Cards with this skill are blocked from (x) amount of attack damage dealt by an enemy card. Does not prevent damage from Bomb, Payback, Punch, or after being successfully gassed. Can prevent the activation of Crazed, Leech, and an initial Gas attack. FC1 (15 health, 8 Sturdy) is attacked by EC1 (10 attack, 3 Gas). FC1 takes 2 attack damage and is now gassed. FC1 (15 health, 10 Sturdy) is attacked by EC1 (10 attack, 3 Gas). EC2 (2 Punch) targets FC1. FC1 only takes 2 Punch damage and is not gassed. FC1 (5 Sturdy) attacks EC1 (3 Payback). FC1 takes 3 Payback damage. FC1 (4 Sturdy), FC2 (8 Sturdy), and FC3 (14 Sturdy). EC2 (7 attack, 5 Bomb) attacks FC2. FC1 and FC3 both take 5 Bomb damage. HEAL - Restores (x) amount of health to a damaged friendly card each turn. Effect is permanent. Skill only restores to max health. Hero (2 Heal) restores health to FC1 (9/10 health), FC1 gains 1 health (now 10 health). FC1 (12/16 health, 4 Recover). FC2 is combined with a new card. FC1 gains 4 max and current health (now 16/20). FC2 (6 Heal) heals FC1. FC1 gains 4 health (now 20/20 health). HEAL ALL - Restores (x) amount of health to all damaged friendly cards each turn. Effect is permanent. Skill only restores to max health. FC3 (4 Heal All) restores health to FC1 (5/12 health), FC2 (7/10 health), and FC4 (4/11 health). FC1 gains 4 health (now 9/12 health), FC2 gains 3 health (now 10/10 health), and FC4 gains 4 health (now 8/11 health. GAS - A card with this skill that makes a successful attack will cause the attacked enemy card to take (x) amount of damage after each round. Effect is permanent. Damage after each round lasts until the affected card is destroyed or until the battle ends. Once affected by Gas, a card can only avoid the damage by being protected by Bodyguard. A card with a high enough Sturdy and/or Shield can avoid being Gassed, as long as they do not lose any health points to the card with the Gas skill. A card protected by a high enough Bodyguard will also avoid taking Gas damage for as long as the card has protection, damage will start to occur if the card loses the Bodyguard from an adjacent card. A successful attack by another Gas card with a higher value will replace the amount of damage done at the end of each round to the higher value, and does not stack. EC1 (9 attack, 8 Gas) attacks FC1 (11 Sturdy or Shield). No damage done, no Gas damage. EC1 (25 health, 10 Payback). FC1 (6 attack, 8 health, 3 Gas) attacks EC1 and gets destroyed by Payback damage. EC1 (now 19 health) is Gassed and takes 3 Gas damage after each round. Opponent takes turn, EC1 takes 3 Gas damage (now 16 health). Player plays new FC1 (7 attack, 5 Gas). Opponent takes another turn, EC1 takes another 3 Gas damage (now 13 health). FC1 attacks EC1. EC1 (now 6 health) will take 5 Gas damage after each round. FC1 (6 Bodyguard from FC2). EC1 (4 Gas) successfully attacks FC1. FC1 is Gassed by 4, but damage after each round is blocked by Bodyguard. A few turns later FC2 is destroyed, FC1 loses it's protection. FC1 will start taking 4 Gas damage after each round. MOTIVATE - Cards adjacent to a card with this skill get (x) amount of extra attack. Effect is not permanent. If the card with this skill is destroyed or has been combo'd without an active motivate skill, the adjacent cards are no longer motivated and lose the extra attack. Skill is active as soon as the card is played. Effect can be stolen by Hijack. Attack gained from Motivate cannot be Crippled Effect can stack on a card in between two cards with Motivate. New card (3 Motivate) is played to replace lost FC2. FC1 (12 attack) and FC3 (14 attack) immediately, gain 3 attack. FC1 (now 15 attack), FC3 (now 17 attack). FC2 is destroyed a few turns later, FC1 and FC3 immediately lose 3 attack. FC1 (8 attack). Player combines new card with FC2 (now 5 Motivate), FC1 (now 13 attack). EC3 (10 Cripple) targets FC1. FC1 loses 3 attack (still 5 attack from FC2's Motivate). HIJACK - Cards with this skill will steal (x) amount of attack from boosts given to the opposing enemy card and then give the attack to itself. Effect can steal attack from Motivate, Cheer, Boost, and Crazed. Skill will only steal attack from the card directly across from it. FC2 (13 attack, 4 Hijack). Enemy hero (1 Cheer All) increases the attack of EC1 (15 attack), EC2 (17 attack), and EC3 (9 attack). EC1 gains 1 attack (now 16 attack). EC2 gains 1 attack, but gets Hijacked by FC2. EC2 (still 17 attack), FC2 gains 1 attack (now 14 attack for one turn). FC1 (15 attack, 7 Hijack), EC1 (18 attack). Opponent plays new card EC2 (4 Motivate). EC1 gains 4 attack, but gets Hijacked by FC1. EC1 (still 18 attack), FC1 gains 4 attack (now 19 attack for one turn). FC1 (19 attack, 3 Hijack,), EC1 (13 attack, 6 Boost). Opponent combines new card with EC2. EC1 gains 6 attack, but gets Hijacked by FC1. EC1 gains 3 attack (now 16 attack), FC1 gains 3 attack (now 22 attack). FC1 (15 attack, 3 Crazed), EC1 (11 attack, 5 Hijack). FC1 attacks EC1. FC1 gains 3 attack, but gets Hijacked by EC1. FC1 (still 15 attack), EC2 gains 3 attack (now 14 attack for one turn). GIVE - Grants a certain skill of a certain value to a random friendly card for one turn. Effect is not permanent. Hero (Give 5 Punch) grants FC2 (3 punch) the skill. FC2 now has 8 Punch. BODYGUARD - Protects the card with this skill, as well as adjacent card(s), from being affected by enemy skill damage. Blocks the first (x) amount of damage from Bomb, Punch, and Gas. Amount of protection does not decrease after blocking damage. Does not block Payback damage. Does not block attack damage. Effect is not permanent. If the card with this skill is destroyed, the adjacent cards are no longer protected. Skill is active as soon as the card is played. A second Bodyguard card with a higher value will replace the amount of protection to the higher value, but will not stack. FC1 (14 health, 5 Bodyguard from FC2), FC2 (16 health, 5 Bodyguard), FC3 (10 health, 5 Bodyguard from FC2). EC1 (8 attack, 5 gas), EC2 (10 attack, 3 Punch), EC3 (9 attack, 4 Bomb) attack, EC2 Punch targets FC3. FC1 takes 8 attack damage and is Gassed by 5, but will not take Gas damage for as long as Bodyguard protects it (now 6 health, still 5 Bodyguard). FC2 takes 10 attack damage, EC3's Bomb is blocked by Bodyguard (now 6 health, still 5 Bodyguard). FC3 takes 9 attack damage, EC2's Punch is blocked by Bodyguard (now 1 health, still 5 Bodyguard). FC1 (6 Bodyguard), FC2 (9 health, 8 Bodyguard from FC3), FC3 (8 Bodyguard). FC2 attacks enemy hero (2 Payback) directly, takes 2 Payback damage (now 7 health, still 8 Bodyguard). FC1 (7 Bodyguard from FC2) is Gassed by 8 but taking only 1 Gas damage each round. FC2 is destroyed along with it's Bodyguard, FC1 starts taking 8 Gas damage each round. Cards with the special symbol ( ) means that the effect applies to cards of the same trait only. Cards with the special symbol ( ) means that the effect applies to cards of the same show only. For example, Zoidberg's Heal Symbol ( ) with special ( ) modifier means that he will restore health to only to damaged Futurama cards. Some cards have specific Traits which can grant special effects or abilities based on Special Events. Special Events change from time to time, and can be viewed by tapping on the red exclamation point on your home screen. 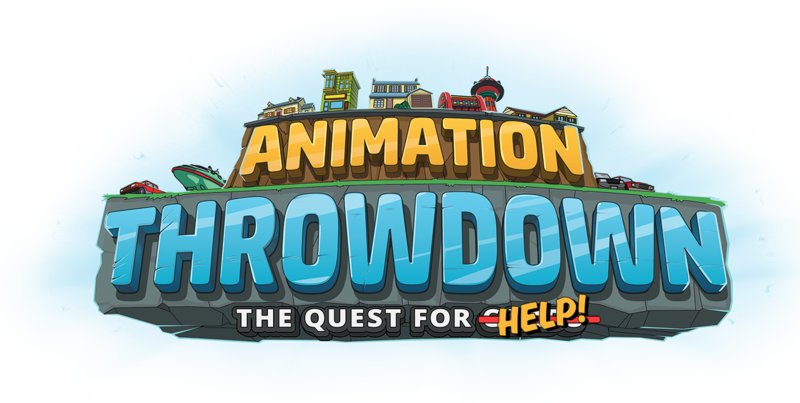 There are currently twelve (12) traits in Animation Throwdown. - Slow "The enemy plays their card first, but the card takes an additional turn to activate." Secret Fight Club and other events may include the effect 'Slow'. - Onyx "All enemy cards have 25% increased Attack and 25% Health." - Heal "All enemy cards are healed by 25% of their base Health every turn." Challenges that can be refilled using Gems and other events may include this effect.